However, neither man is expected to serve time in jail. Under the Spanish system, prison terms of under two years can be served under probation. Is Messi best of all time? Quizz: How well do you know Messi? The sentence can be appealed against via the Spanish supreme court. 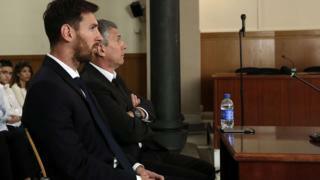 "The club... considers that the player, who has corrected his position with the Spanish tax office, is in no way criminally responsible with regards to the facts underlined in this case."